A new consultation is out on changes to Cable St, including some improvements to Cycle Superhighway 3. Whilst we would like to see the scheme go further, there are some good proposals here, in particular a major improvement to the confusing junction with Sutton St and a new parallel pedestrian/cyclist zebra crossing and contraflow cycle lane at King David Lane. LB Tower Hamlets are consulting on a filtered permeability scheme in the Cable Street area that aims to improve the pedestrian and cycle environment - see the consultation announcement and flyer distributed to residents. London Assembly Green Party member Darren Johnson has tabled two CS2 upgrade questions for Mayor's Questions at City Hall on Wednesday morning (21 Jan) and we are going along for a publicity photocall. Could you join us? Time is 9.15am for about 30 mins, outside City Hall, SE1 2AA [location map]. Following on from the Cycle Superhighway 2 summit held at City Hall on 28 November, organiser John Biggs (London Assembly Member for City of London, Tower Hamlets, Newham and Barking & Dagenham) has sent the attached letter to the Mayor of London, with a copy to the Mayor’s Cycling Commissioner Andrew Gilligan (who attended the meeting) and Commissioner of Transport for London, Sir Peter Hendy. It summarises the suggestions and comments made by the panel and audience about how to improve CS2. 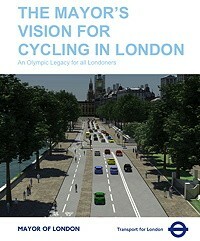 We had a quick look in the Vision for Cycling in London to see what's in it for east London. Published in early March the Mayor of London's document is described by LCC as, "one of the most ambitious plans to promote cycling ever produced by a major UK political leader". This letter was originally published in a personal capacity in the 2nd December 2011 edition of Local Transport Today (subscription required), a fortnightly transport planning magazine. Firstly, I would like to thank everybody involved in organising and spreading the word about the Candlelit Vigil at Bow Roundabout, I saw a lot of planning and organisation at very short notice, and with care and sensitivity. Secondly, thanks everyone who attended, and those who spoke, and pledged their support in whatever way, in making sure this never happens again. In my mind, it was a very moving and necessary thing to do. 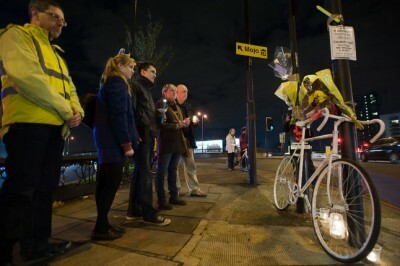 The cycling and local community came together at Bow roundabout for a poignant candlelit vigil in the presence of the family and friends of the two cyclists who recently lost their lives there. 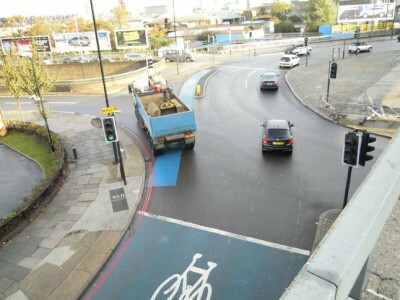 After two fatal crashes in three weeks at Bow roundabout the London Cycling Campaign (LCC) is calling for all who find the current layout unacceptable to write to the Mayor of London telling him "Bow roundabout needs to be redesigned to make it safe for cyclists".